'Spotting incidents’ is the brand new NoticeBored security awareness and training module for April. Whether you consider them to be incidents or not, suspicious activities and near-misses are also worth reporting if ‘early warning’ is something you and your management would appreciate. Nasty surprises are, well, nasty. The sooner you know about trouble on the horizon, the more options you have, not least the possibility of deftly avoiding the minefields ahead. Those three streams support each other, setting workers thinking and talking about this topic, fostering the security culture in a general way. It’s a good topic for socializing security among the organization because it is relevant to, involves and affects everyone. Think about your learning objectives in this area. 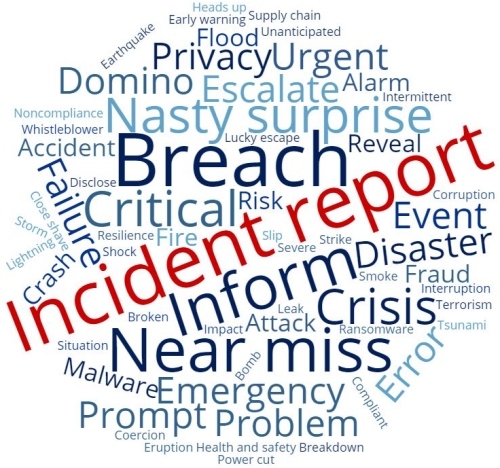 What are your organization’s challenges around spotting incidents? If you are struggling to deal with the volume of incident-related reports already flowing and reluctant to invite yet more, you’d better get more efficient at assessing, handling and using those reports! The preferred way to cut the volume of incident reports is to improve your information security, which includes improving the quality and relevance as well as timeliness of incident reporting. Don’t just complain: raise your game! Subscribe to NoticeBored for access to 'spotting incidents' and other creative security awareness and training materials, delivered fresh every month.